I’m writing this with a very heavy heart. You probably have heard the news that 5 Ft. Bliss soldiers were killed on patrol last week in Afghanistan. I learned Sunday morning, before the official list was released, that one of the soldiers was the husband of one of my friends here. I met Miranda towards the beginning of the year when we joined the same weekly Bible Study. I’ve admired her for a long time. She’s transparent, strong, funny, beautiful, a former soldier herself, mothering an infant and a toddler during this deployment. She’s an AMAZING photographer, generous, with a laugh that fills a room. Now she’s a Gold Star wife. And I hate it. If “hate” is even a strong enough word. Sunday I went on to church, because I had signed up to bring the food for Sunday School (Baptists need their food) but also, I just needed to be there. I needed to hear about Jesus. I needed to focus on Jesus. And I wasn’t disappointed. I was blessed to be with a group of people praising God and thanking Him for our hope of eternal life. 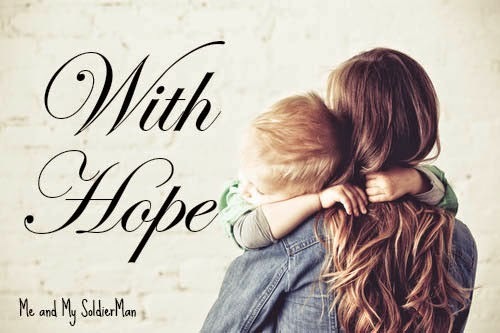 And I cried, inwardly pouring my heart out to Yahweh and thanking him that James had also had that hope, and asking the Holy Spirit to keep that assurance forefront on Miranda’s mind. I spent the afternoon searching through God’s Word for comfort. The blackout was still on, and I hadn’t heard from SoldierMan for a while. I was struggling with fear. Even though I knew he was okay now, suddenly I felt afraid like I hadn’t thus far in the deployment. This group were our brigade’s first casualties. And I was afraid. So I turned to the Word. Maybe for other people, they instantly are consumed with prayer or spiritual music, but that wasn’t what I needed. I didn’t need to talk to God. I needed to hear from God. I needed reassurance of His promises. And I read. And I cried. And I tried to pray but not much came out. I just cried. That evening, almost two dozen of us gathered together to pray for Miranda, for her children, for the surviving soldiers, for our own wounded spirits as we hurt for our friend and feared for our husbands. We prayed and cried and called out to God and poured out our souls and listened for His voice. I only wish Miranda could have been there so we could have loved on her in person. Lots of love was sent her direction. And God was there. Jesus was there with us. I won’t speak for others, but I felt the Holy Spirit in that room. Out of respect for the others I waited till I was in the car, but by the end of the night, my heart was bursting to praise God. Not because my friend was in pain, not because her children would grow up without their father. But because I knew that, even in the pain, God had not abandoned her. God was not surprised by James’ death. And Yahweh will not forget Miranda, Yahweh will not abandon her children. And in His great lovingkindess and grace, God planned before the foundation of the world (Ephesians 1) a way for James and Miranda to be reunited even after death. Throughout His Word, Yahweh speaks again and again of his love for the widow and the orphan. Yahweh has not left my friend, and Yahweh will never leave her. Thank you, Father God, that you draw near to the brokenhearted, and you rescue the crushed in spirit. (Psalm 34:18) Let Miranda please feel your closeness in a very real, tangible way. My heart is breaking for Miranda and for her babies. And it grieves me deeply that James will never take his son to t-ball practice. James will never walk his daughter down the aisle on her wedding day. I mourn all the days they will never have together. I don’t understand it. “Unfair” seems like an understatement. And I thank God, that because Jesus overcame death – actual death, was actually killed and actually died, and then actually came back to life – that James has also overcome death. Because he had put his trust in Jesus as Savior and Lord, not only as Savior of his eternal soul but Lord of his life here on earth, we can say with total assurance that he is now with that Savior in Heaven. I’d be negligent as a blogger and as a friend if I didn’t beg each of you reading this to please, please search your own hearts, evaluate your own relationship with God, and search the Scriptures to see where your faith is really placed. I’m sure that James and the other soldiers in his patrol planned to be sleeping in their own beds that night. Ultimately, none of us has any control over whether or not we will see tomorrow. Don’t wait until tomorrow. Draw near to Yahweh while you can. I’m adding James’s name to my sidebar in memoriam, but he is very much alive and awaiting an unbelievably joyful reunion with his family one day, because of the hope and power of the resurrection of Jesus. James was a soldier, his job was to identify and eliminate the enemy. Ultimately, he did just that. My heart is sad and heavy at the loss of 5 more soldiers but is rejoicing that James is with heaven. I'll be praying for Miranda, that she'll lean on Jesus during this incredibly difficult time and in the years to come. I'll keep you in my prayers as well. Be blessed my friend. Every tragedy breaks my heart even more. It feels too close. This is beautiful. While the whole situation is terribly heartbreaking, I'm glad she has faithful, loving friends like you and the rest of your church. I am keeping you and all of these families in my thoughts and prayers. My heart is so heavy for her, their children and all of the families. How you spoke of your friends couldn't have been more loving and inspiring. Every moment that I felt myself tearing up in this post, your words and the scripture leave so much hope and so much Truth of what we have to look forward to after this. My husband was in the same ROTC & IBOLC class as Brandon (James). We all shared dinners, traded babysitting, and became friends. My heart is broken for Miranda and her family. Brandon is a hero. My heart has been breaking since I heard about this. My husband also knew Brandon from training and I am devastated for his family. I have been praying for them constantly. My heart hurts for you and for your friend. The community over here recently experienced a loss. I'll spare you the details, because it's just sad. Sad is the only word I can think of to describe how horrible it is. Thinking of you. Well said. My heart goes out to her family and all others affected. I will always consider Ft. Bliss and 1-1 our first "Army home" and this is truly moving. What a beautiful post. You have done a wonderful job of reconciling the grieving process with the Hope we have in Christ. Paul doesn't chastise the believers for grieving. Grieving is part of the healing process. We all need time to grieve and those closest will need more time than those less invested in the relationship. Paul gently reminds us that we should not grieve as those who have no hope. You did such a wonderful job of expressing that hope and the reality of the Truth of the resurrection. Death is not the end - it is part of the continuum of life for the believer. Thanks so much for sharing your thoughts so eloquently. Thank you for sharing this. I will be praying for the family. Jaci, I just found your blog. This was a heart-breaking yet beautiful post. I love where you said that you "needed to hear from God." Sometimes we just need to be still and hear His voice...it is the most comforting thing in the world. I will be praying for Miranda and her precious family. I always love your posts but this one, obviously, hit home for me. So beautifully written. To be honest, I'm glad I read it right at this moment because I believe iti s exactly what I needed. I am praying for your friend still. I hope she is doing well. And please let her know (you probably already have) that she can contact me, any time day or night, if she needs someone to chat with that's "been there."